The rest (about 18%) declared “XenApp 6.5 FOREVER” which is both amusing and terrifying. If this small sample is any indicator, people are more excited about upgrading to 7.15 LTSR than I actually expected. I expected much higher numbers of Not Sure (noone said this) and those wanting/having to keep XenApp 6.5 going. 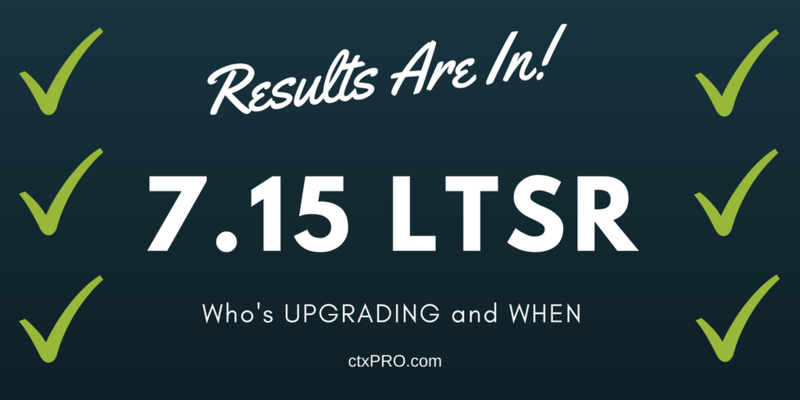 This means that over 80% of users surveyed intend to be upgrading to XenDesktop 7.15 LTSR. My guess here is that the majority of people responding already have XenDesktop 7.6 LTSR in production and have been aching for the new features so many others have been enjoying on the Current Release (CR) track. These folks would likely be those in the primary Citrix Enterprise market, where stability is key. Let’s face it. The world has moved pretty fast and Citrix has been developing new features to meet needs WAY faster than Microsoft is putting out OS releases for the same reasons. Yet the LTSR release by it’s nature will lag behind the occasional Microsoft release. This means they have not gone to 7.6 LTSR because they were lacking a feature of some sort; be it Windows 10 support or something similar. Or maybe they were still on 6.5 and waiting for one key feature, such as some offline ability to broker sessions. Or maybe machine creation services that have been available for Server OS in the CR track for awhile now but LTSR was lagging painfully behind, making a cloud migration nearly impossible. This is probably what I hear a lot of for size of farm but not as many customers- but honestly… even I am in the camp of wondering why it was this long before FMA finally has at least a real shot at feature parity with 6.5 if not a real shot at delivering it in a way that is actually usable? By this I mean Citrix has up to this point had a bit of a fail in truly convincing those with large 6.5 farms that they could be serviced by FMA based farms. And you know what? It was actually true. So- time will tell; but my guess is that most of those answering that they would like to stay on 6.5 (IMA) ‘forever’ is because the switch to 7.x (FMA) looks RISKY. Solve the risk in the real world, and you’ll have a winner, Citrix. I’ll be diving more into 7.15 LTSR soon. I have only a few clients currently upgraded to be able to give real results but so far I have not had any broker-related issues. As we expand into larger production environments I’ll share more observations but for now- I’d say if you haven’t gotten this into your test labs you really need to! It’s awesome! Thanks to those who responded. I’d love to hear from you. Why are you upgrading? Not upgrading? I have my ideas of course- but I’d love to see some ideas in the comments or on our Facebook page!